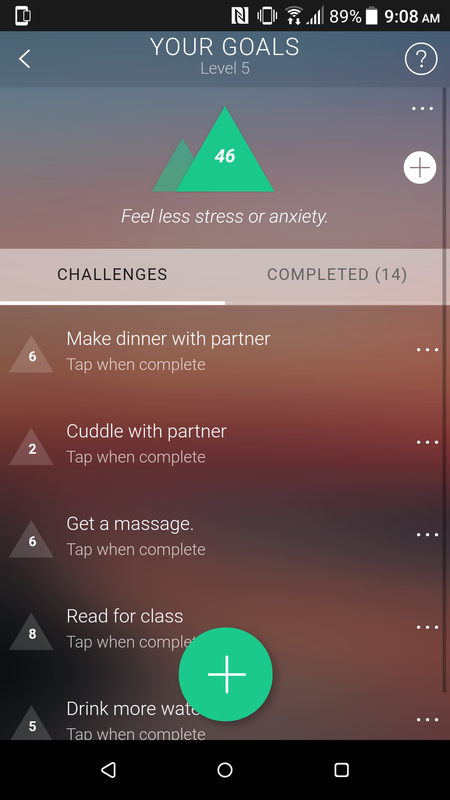 One of the first tasks I was given as an intern at Catholic Charities was to research and find some phone apps that would help with anxiety, depression, weight management and med management for our clients. Knowing that I suffer from pretty bad anxiety at times I decided that would be the first one I would tackle. The first app that I stumbled across was Pacifica. Pacifica is an app you can download on IOS or Android. 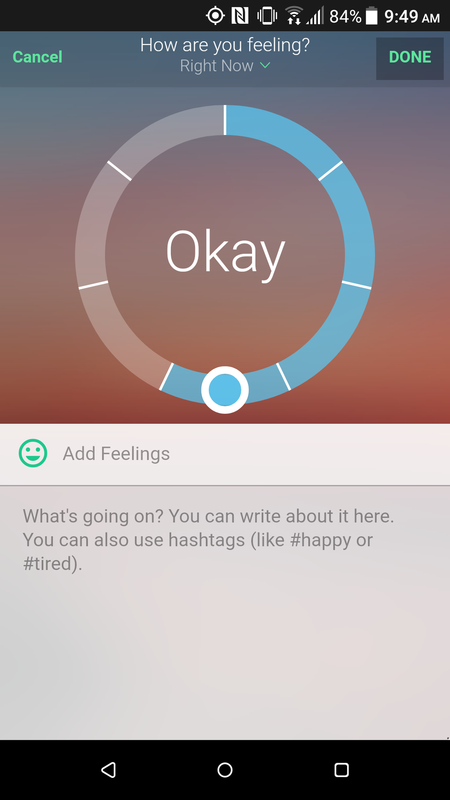 It has a few different ways to help you monitor your anxiety and your moods as well as suggesting things you can do to help your mood. When you first open Pacifica you will be asked to sign up. You can connect with your Google account, your facebook account or your Apple ID. You will be asked to set an overall goal that you want to work towards while using Pacifica. There is a lot you can do on Pacifica without having to pay for a membership. Anything you see with a lock on it, means you have to be a member to use that feature. However, I have found that I have a lot I can do without being a member. PLEASE NOTE: All photos are screenshots of my personal account. I am not affiliated with Pacifica in any way other than through my personal use. The first screen you come across in Pacifica is your daily tracking screen. This allows you to pick where you want to go first. I usually start by choosing my mood. First, you click on the mood button at the center of your home screen. This allows you to scale your mood from Great to Awful. You can also address and add any feelings that may be causing your mood to be the way it is. 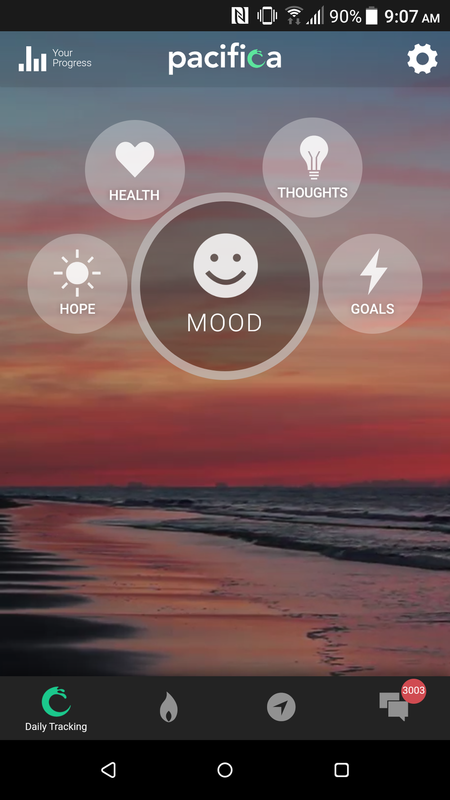 After you hit done, you are brought back to your daily tracking screen which will now display your mood at the bottom and ask if you'd like to take action to combat your mood. 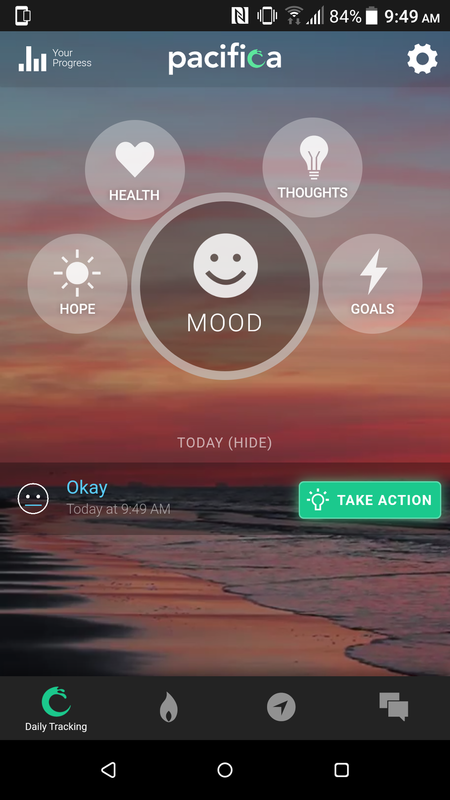 When you click on take action you are brought to screen that suggests activities you can do in the app to help improve your mood. 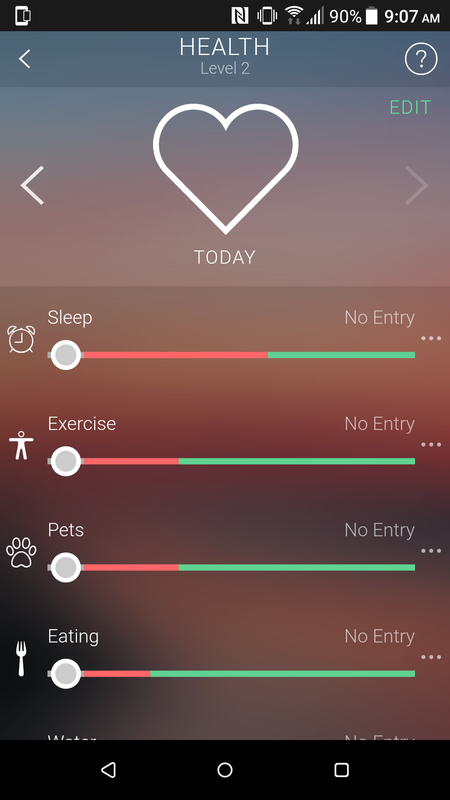 You are also given the ability to pick your energy level which will change the suggested activities. On your hope board, you can add pictures, quotes, anything really that makes you hopeful. You can look at your board when you are having a bad day to see the things that make you hope for a better day. 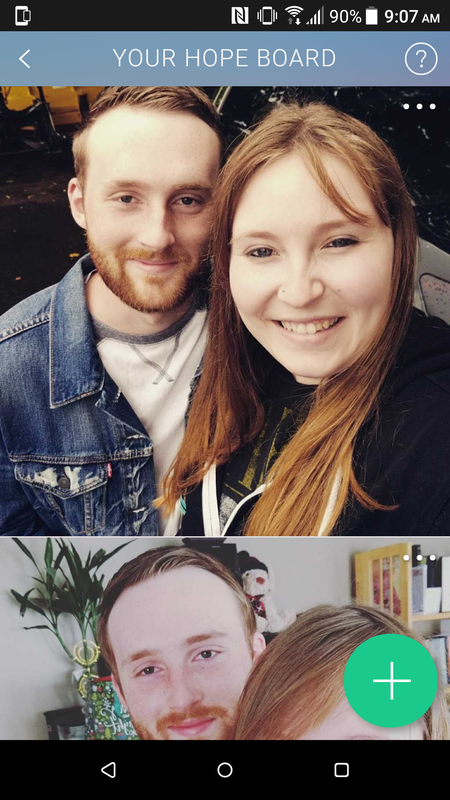 Currently, I have pictures of me and my fiance and of my cats! This tab is pretty cool. It helps you monitor daily habits that can improve or deteriorate your health. It helps your track things such as your eating, your water intake, your exercise, if you've had any caffeine, how much time you've spent with pets, friends, family or your partner and a wide variety of other things. 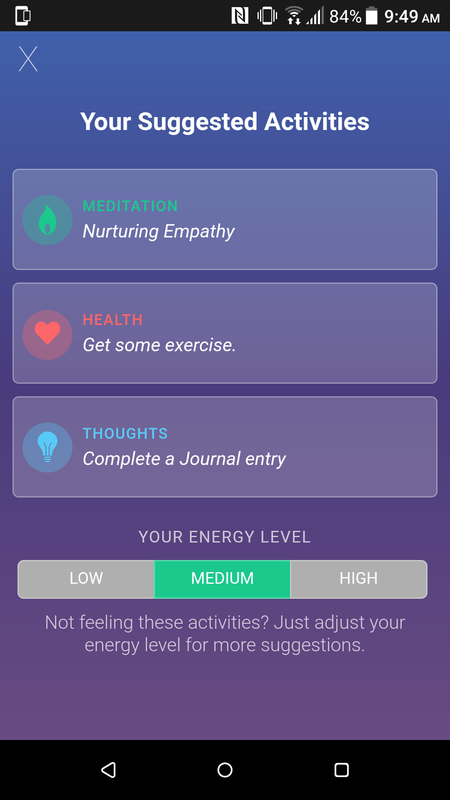 You can pick and choose which ones you want by scrolling to the bottom of the health screen and hitting the 'add a daily habit' button. This is one section I haven't played around with much yet, but it seems like it could be incredibly useful in the near future. This allows you to track your thoughts and how you got to them. 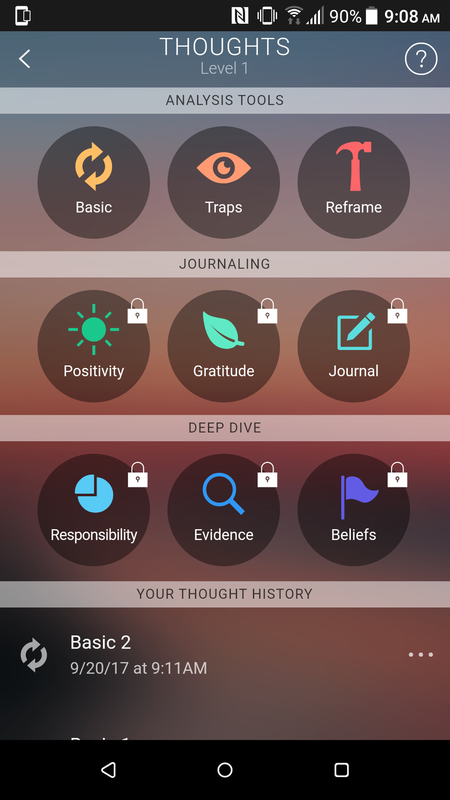 It allows you to record your thoughts, record any traps that bring you to those thoughts and helps you reframe your thoughts into a more positive light. Here you can set yourself goals you want to accomplish in the next few days or in that day itself. By clicking on the green plus sign you can find one of the goals that Pacifica already has in their system or you can make your own. I try to choose several goals to accomplish over the day. This is the icon that looks like the top of a lit match on the bottom of your daily tracking screen. 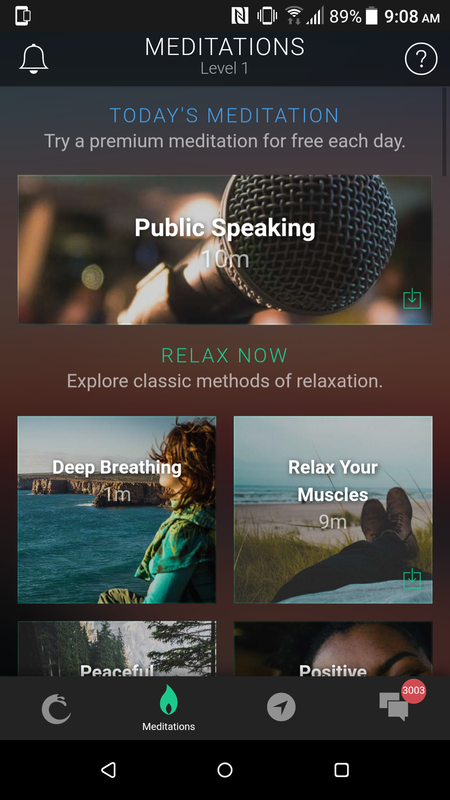 Here you can choose from a few different meditations to help you calm down, relax, be mindful or deal with a stressful situation. Each day Pacifica allows you to try one of the premium meditations for free! I use the deep breathing meditation each day when I wake up and every night before I go to sleep. This is the circle with an arrow icon on the bottom of your daily tracking screen. 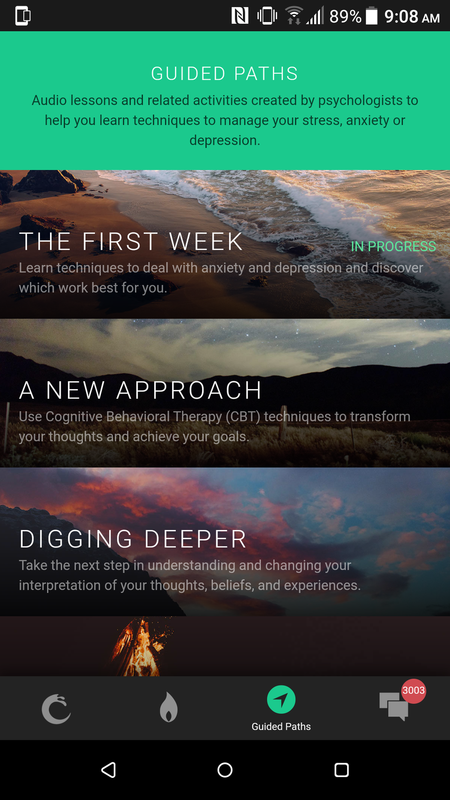 These are audio lessons that have been recorded by a psychiatrist to help you manage your stress and anxiety. I haven't gotten very far with these yet, but hope to explore them more soon. This is the text bubble icon on the bottom of your daily tracking screen. 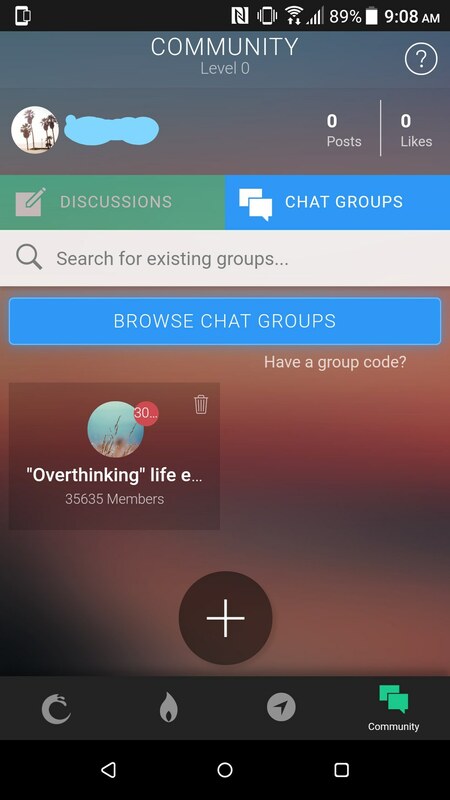 Here you can make a username and speak in various community boards about what issues are current in your life or you can suggest ways to help other people with their issues. I'm currently only a member of one board for overthinking because that is one of my biggest faults when it comes to my anxiety. Why Am I Using Pacifica? Overall, Pacifica has helped me a lot. I set goals every morning and I complete four or five daily. It helps me work through bad thoughts and stressful situations.